Amazon EC2 now allows peering relationships to be established between Virtual Private Clouds (VPCs) across different AWS regions. 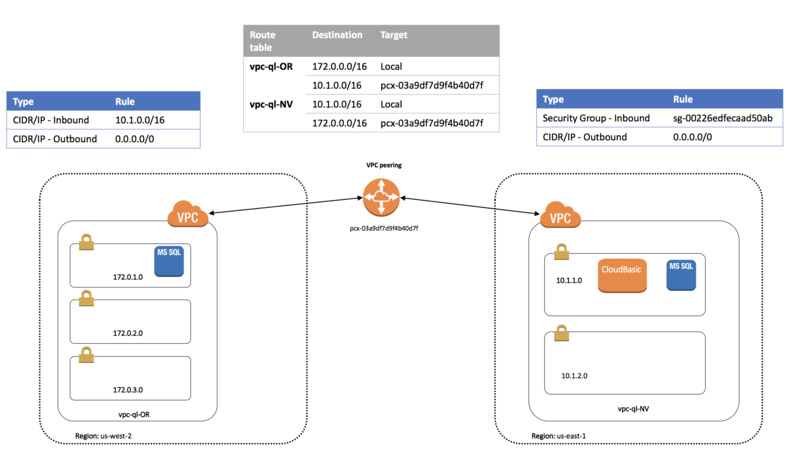 Inter-Region VPC Peering allows VPC resources like EC2 instances, RDS databases and Lambda functions running in different AWS regions to communicate with each other using private IP addresses, without requiring gateways, VPN connections or separate network appliances. Inter-Region VPC Peering provides a simple and cost-effective way to share resources between regions or replicate data for geographic redundancy. Built on the same horizontally scaled, redundant, and highly available technology that powers VPC today, Inter-Region VPC Peering encrypts inter-region traffic with no single point of failure or bandwidth bottleneck. Traffic using Inter-Region VPC Peering always stays on the global AWS backbone and never traverses the public internet, thereby reducing threat vectors, such as common exploits and DDoS attacks. RDS\EC2 SQL Server Multi-AZ and Multi-AR (Cross-Region) Readable-Replicas for HA/DR, reporting, off-loading of primaries. On-Premise to AWS replication for Cloud HA/DR.